The Difference Between Hot Rolled Steel and Cold Rolled Steel. Home | Products | What is The Difference Between Hot and Cold Rolled Steel? In this process, the steel is rolled at a temperature normally in excess of 1700F which is above the steel’s recrystallization temperature. 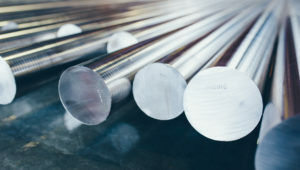 When steel is higher than the recrystallization temperature, it can be formed and shaped easily, and the steel can be manufactured in much larger sizes. Hot rolled steel is commonly cheaper than cold rolled steel because there are no delays in the manufacturing process. This means that unlike cold rolled steel it doesn’t have to be reheated. There will be some shrinkage when the steel cools down resulting in less control over the shape and size of the finished product, in comparison to cold rolled. Hot rolled products like hot-rolled steel bars are used in the construction industry and welding trade to make I-Beams and tracks for the railway as one example. In any situation where precision of shape and tolerance are not important hot rolled steel is often used. Cold rolled steel is essentially hot rolled steel that has had further processing. The steel is processed further in cold reduction mills, where the material is cooled at room temperature followed by annealing and/or tempers rolling. This process will produce steel with closer dimensional tolerances and a wider range of surface finishes. The term Cold Rolled is mistakenly used on all products when actually the product name refers to the rolling of flat-rolled sheet and coil products. When referring to bar products, the term used is “cold finishing”, which usually consists of cold drawing and/or turning, grinding and polishing. All cold products provide a superior surface finish and are superior in tolerance, concentricity, and straightness when compared to hot rolled. Cold finished bars are typically harder to work with than hot-rolled due to the increased carbon content. However, this doesn’t apply to cold-rolled sheet and hot rolled sheet. With these two products, the cold rolled product has low carbon content and it is typically annealed, making it softer than hot rolled sheet. Cold rolled steel can be used in any project where tolerances, surface condition, concentricity and straightness are the major factors. Contact us for more information about our Hot and Cold Rolled Steel, we will be happy to share our vast knowledge and experience with you.